Here is a picture of my home built 80mm(Carton Lens) f/12.5, and my home built 50mm(Surplus Shed lens) f/12 finder. Sorry I didn't have anyone other then myself to take the picture so I'm not in it. Thanks for posting! What a unique color combination !! Good threads Gary, both part one and two. The friendship between yourself and Mel is incredible, I could only imagine some of the fantastic observing sessions you two have had not to mention your ATM hours. Astronomy is a Gentlemen's sport and I couldn't think of two more perfect examples as yourself and Mel. Cloudy Nights is lucky to have you both. Do you have any photos of the two of you together on any such occasion? If so could you post one. Thanks Brian ! Its good to hear from you again. What have you been up to lately ? Do you have any new projects planned ? Mel and I have some pics of us that were taken from his home in Florida during an observing session while I visited there. 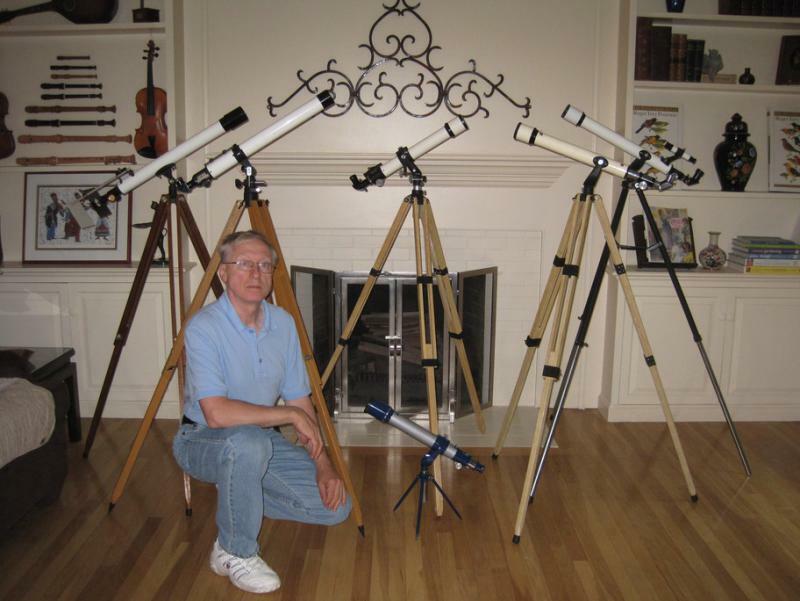 I will be getting in touch with him soon, and we will definitely post some images .We have also shared many observing sessions dating all the way back to 1970,and it was from this activity that we founded the Vega Sky Center on August 16,1970, some 43 years ago. It was then called the Vega Observatory . 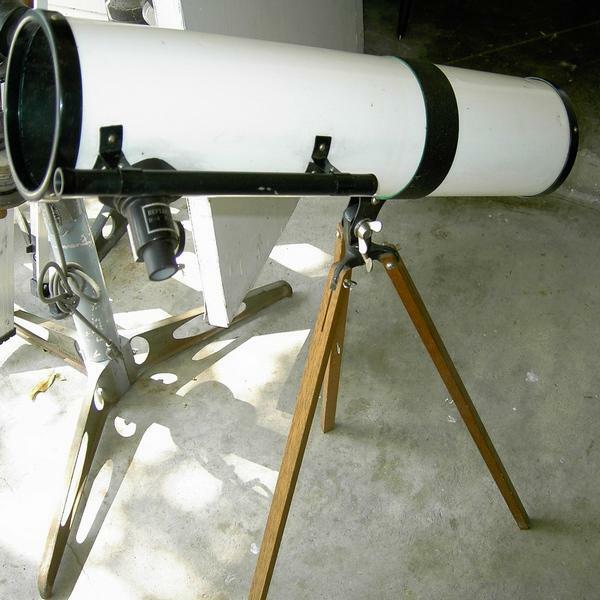 Started out with a couple of small telescopes- Selsi 60mm variable power refractor and a Selsi 4 inch f/8 alt-azimuth reflector back then. 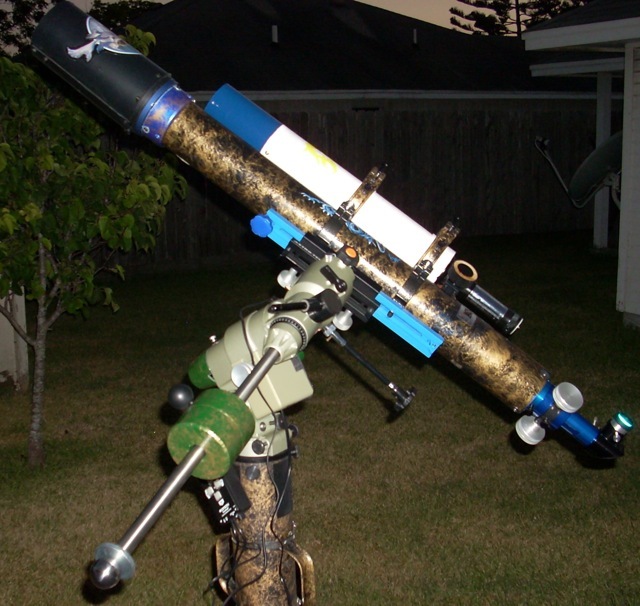 The event that night was a partial lunar eclipse and we used these scopes to observe it. Brian, I've always hoped to find replicas of the scopes from back then, and I've been fortunate to have done so. 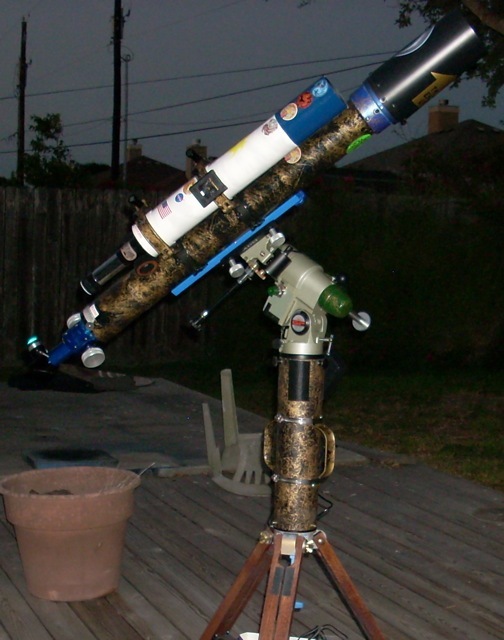 The first view is that of the 60mm Variable Power (15x, 30x, 45x, and 60x)alt-azimuth scope. Though this one was marketed by HOLMAR, it is exactly like the Selsi I had back then, down to the color of the focuser, dewshield and tube. This scope, like the aforementioned Selsi has no focuser label,so I don't know who actually built them. 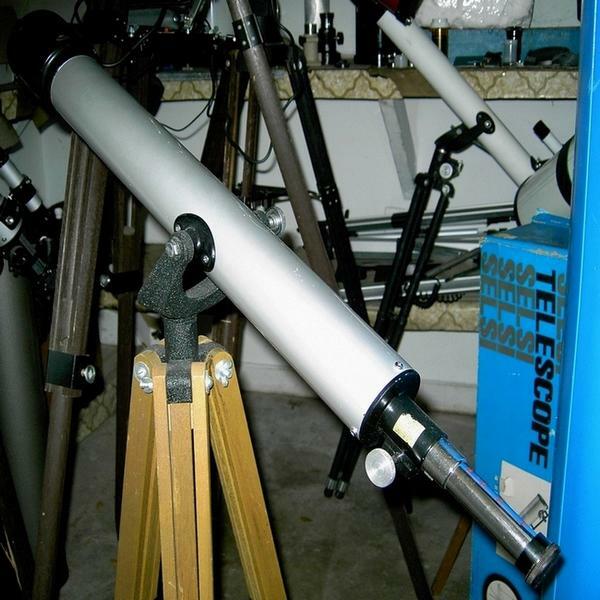 However, I also have a white Selsi made exactly like these two,with a Circle T(TOWA)on the tube near the focuser, so I will say that they both were Circle T's.You can see part of the box the 234 came in as well as part of the scope itself. When I was making the 50mm I confined myself to using what supplies I had on hand. I had an old white mailing tube I wanted to use, but I didn't have any black spray paint at the time. So I just clear coated the tube to seal it, and that is why the two different color tubes. Wow, Gary, that makes me revisit old memories! The ota is very similar to my first telescope, especially the 'finder' scope, although the tube mounting to the alt-az mount was different from memory and the tripod too. That was the scope that started my interest in astronomy, I guess in the arly to mid 70s. Thanks for rekindling those memories. I'll PM you as not to tie up your thread. But im still holding you to the photo of you and Mel together observing. Thank you so much for the kind words you conveyed to Gary and I. Our friendship goes back quite a ways. It is hard to believe sometimes that we stayed in touch with each other for so long. Gary is indeed a true brother and dear friend. But, I must say that meeting great amateurs like you, Brian, is just a as fulfilling. The information and support you have given me during my ATM projects will never be forgotten. Thank you very much, and for being there. 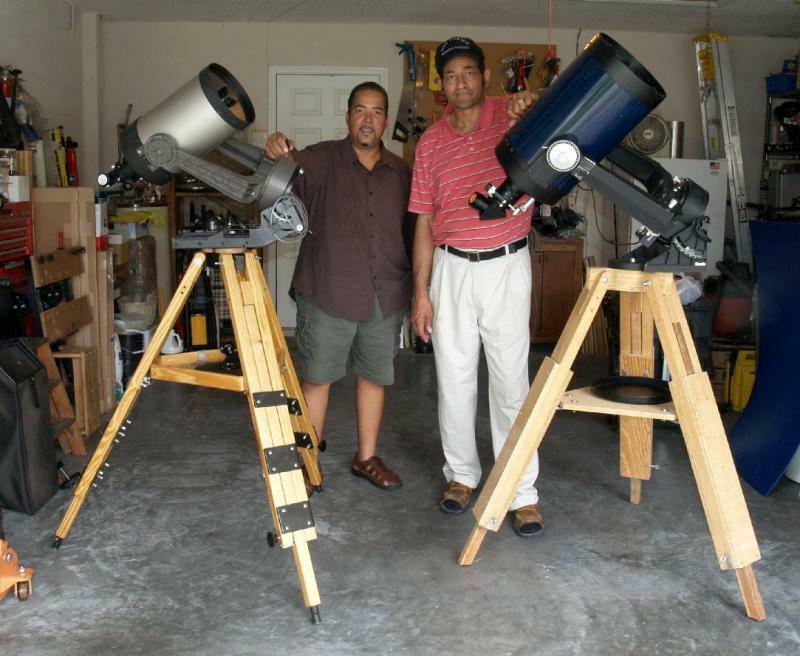 As you requested, here is a photo of Gary and I observing back in October of 2005 at my residence, just after Hurricane Katrina destroyed his home. ...here is another one of Gary and I with my 8" Celestron f/10 and his 10" Meade f/10 SCT's. His was sitting atop the North Star prototype field tripod, and mine is on the new North Star II. 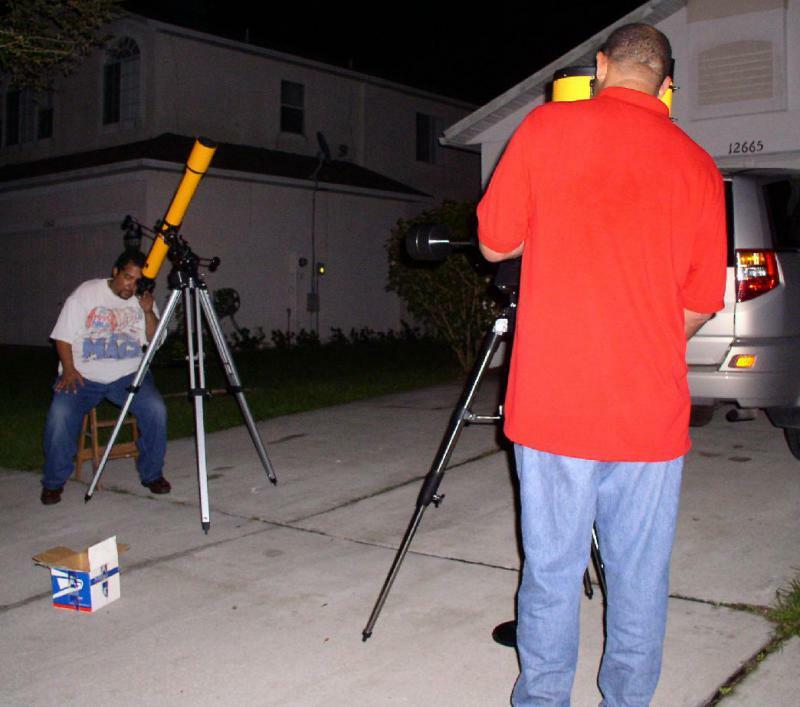 We were getting ready for an observing session on June 29, 2011. You guys are both Classic and Classy Gentlemen! Both of you have made my time here on CN"s so pleasurable. You guys always have something nice to bring to the table and are always filled with compliments. We have many nice members here on CN's but you two are the cream of the crop. Here ya go. Me with my 77mm f=1200 Eikow. Thanks, Brian ! 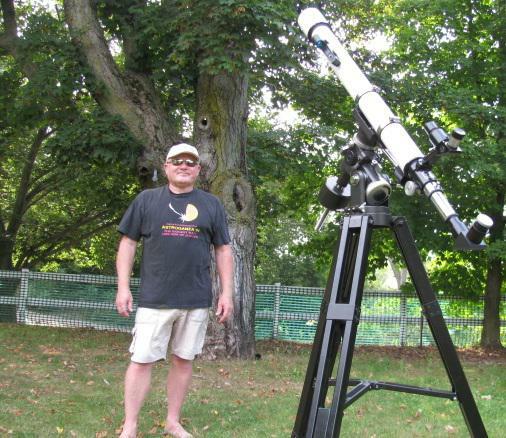 Grava T, a cool scope and its owner. Thanks for posting !! 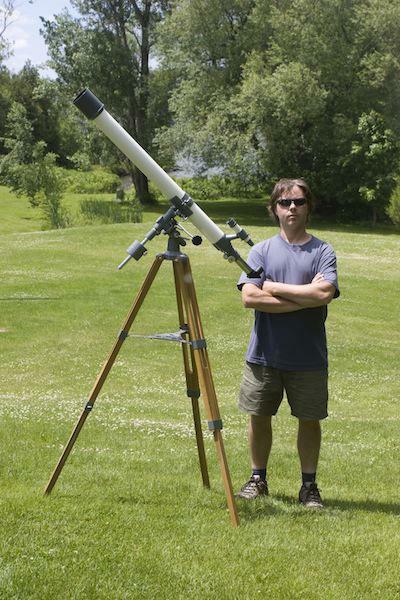 I posted a similar shot in the refractor forum, but I'm in this shot, so I'm safe. L to R: 1969 Sans & Streiffe 618; Optica b/c; 1968 Sears 6339-A (on mantle w/mount awaiting rebuild); 1960 Swift 831; 1969 6339-A. I have too many scopes. I have too many scopes. I don't think so, looks like there's more floor space available to the sides and front! The empty spaces might hold the 50mm & 60mm scopes. Quite honestly, the 50mm scopes are what I use most. They are very much grab & go with excellent optics and they all have large drawtubes and can be used with 1.25" accessories. I am truly astound of your collection! I also have Sears 6339-A, but I have to do some minor restoration work on it. You are looking like classic royalty in your photo. OK, just one more. These are the 50mm scopes. 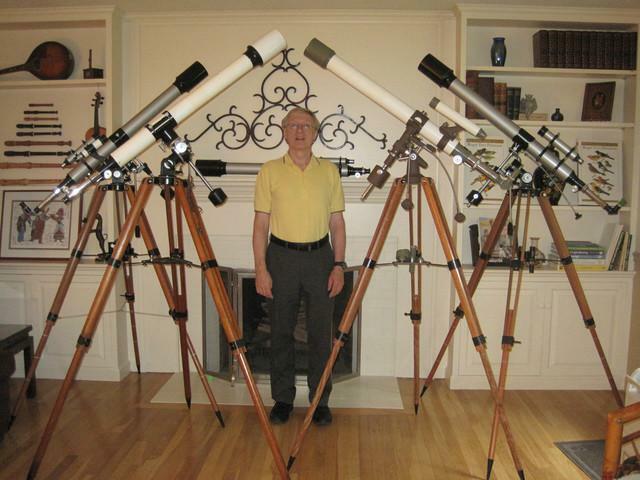 L to R: Sears 24146 (600mm) - a good scope, but not great; Unitron 105 (700mm) - a truly great scope; HyScore 457 (500mm) - same as Astro Optical R-53 - another great scope; Tasco Terrastro (600mm) very well built - optics are greatly improved since I de-cemented the the components and air spaced them; Tasco 66TE Cosmic II (600mm)- an excellent performer; on the floor - Bushnell Sky Rover (500mm) - the best 50mm scope I've ever used. I'll bet that mount works like a charm with that scope. Grava, nice scope and yard. Quick question: Don't you mean 77mm F=1000 ? Thanks Charlie, you are right about the mount, a real nice combo.